Seven whole days to try for treats. © FarmgirlFare.com, where everybody only thinks they're starving. 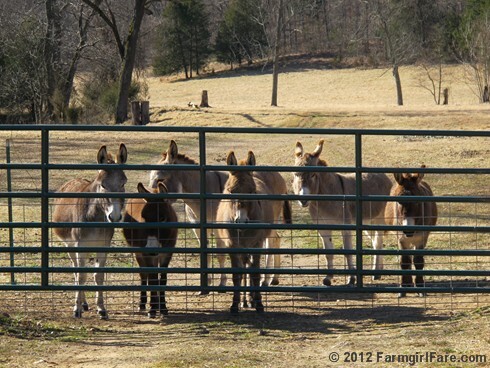 Every day is actually treat day for our seven donkeys (Daphne, aka The Daphinator, is off to the right, braying loudly), but they think it should happen twice a day. Or even three times. You've got to admire their optimism and persistence. P.S. Found you when I was looking for a beer bread recipe. Silly donkeys, always looking for a handout! Donkey cute to the max! So cute! I always think of the SHREK movies when I see donkeys! "I'm makin' waffles!"